The Exchange Hotel in Amsterdam was developed in close collaboration with the Amsterdam Fashion Institute (AMFI) - each of the 62 rooms was designed and dressed by students and alumni. The result is a hotel where architecture meets fashion. The romantic at heart can fall asleep in a Marie Antoinette-inspired room where a huge dress drapes over the walls and unto the bed. 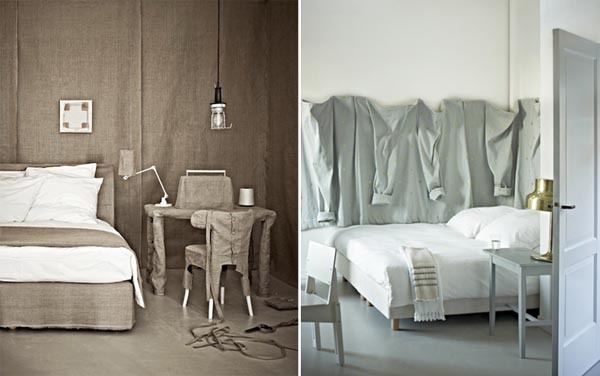 Those who prefer a more minimal look can opt for a room that was inspired by the story of the Emperor’s New Clothes. The Exchange Hotel, Amsterdam (found via Design Tripper).